You are welcome by our driver, transfer to your hotel. Champagne and flowers will be waiting in the room. Enjoy a free day to explore the city. 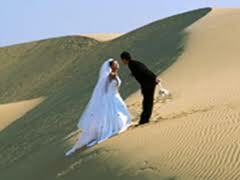 Transfer to Quy Nhon and enjoy the pristine beach and isolated location – a perfect setting for newlyweds to enjoy. Free day to enjoy the activities in the hotel like Spa, Tai Chi, yoga, swimming or simply lazy by the pool. Day trips are optional to explore the surrounding Cham culture. Car transfer to Hoi An Town, the unique place of beach and town and vrious culture, shopping… Check into a beach resort and relax for the afternoon. Walking tour in the morning to visit the Hoi An Town. Afternoon, free for your own leisure to go shopping in town or sip a drink by the river. Private car picks you up at hotel. Transfer to airport for flight to Hanoi. On arrival, car picks up at airport and transfer to your hotel. Afternoon, enjoy the Spa Package included Foot Treatment, Body Scrub, Herbal Steam Bath & Therapy, Facial Treatment together. Dinner in one of the charming restaurant or in the room can be arranged upon on your request. Visit some remarkable sites of Hanoi including Ho Chi Minh Complex, Temple of Liberature, museum… all on your choices. Or an option of Cooking class can be arranged for food lovers. Car transfer to Halong. You are welcomed on board and have seafood lunch while cruising to magnificient Halong Bay and thousand of limestome ilsets. Kayaking and swimming in the afternoon. Overnight on boat. Morning view of Bay’s landscape with a cup of tea of coffee. Have breakfast in the fresh air. Then you start cruising to Tra Gioi for kayaking and swimming or relaxing on a wild beach. Have BBQ lunch on beach or on boat. Continue kayaking to explore the bay. Visit mysterious Thien Canh Cave. Back to the junk for cruise to Cong Do. Relax on board and enjoy sunset. Have dinner and overnight on board. Check out for the drive back straight to Noi Bai airport in Hanoi for a departure flight. Domestic flight tickets HCMC – Quy Nhon/ Danang – Hanoi (2 legs, economy class on Vietnam Airlines). Taxes, service charges, Bank fees (if paying by credit cards). Check in time is normally at 14.00, check out time is normally at 12.00. Early check in or check out is upon on availability of the hotels. The detailed itinerary of Halong Cruises might be different depends on your junk choice.